Our NY city and tri-state janitorial services will guarantee your building is always clean, well-maintained and a pleasure to walk into. For your New York or Tri-State office or business to look professional it needs to be kept clean, organized and sanitary at all times. 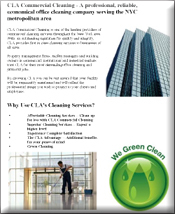 CLA Commercial Cleaning's janitorial services will ensure your facility is properly maintained, healthy, and A comfortable work environment that is welcoming to your clients and keeps your employees performing at their best. Our janitorial cleaning crews are trained and experienced in keeping your office or business in the best of condition.We have janitors working at hotels, institutions, offices, clubs, restaurants and other commercial facilities throughout New York City and the Tri-State area. We know how to work around your employees without interrupting their routines or we can come in to clean during off hours, if you prefer. Our janitors are aware of the need for security procedures and are well versed in locking doors and windows, activating burglar alarms and any other steps that might be required to keep your premises secure. We are also aware of the need to save energy by turning off all lights before we leave. Any other janitorial jobs as you see fit. With CLA Commercial Cleaning's janitorial services your New York or Tri-State office or business will never have looked so good. Contact us today for a FREE estimate and to find out more. Call on 646-532-3750 or write to us online. For all your office and business, residential, window, and carpet cleaning, as well as floor waxing and finishing, and janitorial and porter service, CLA Commercial Cleaning offers top quality work and some of the most affordable rates in New York and the Tri State are.